Last Sunday I woke up in State College and went on an early run through town. 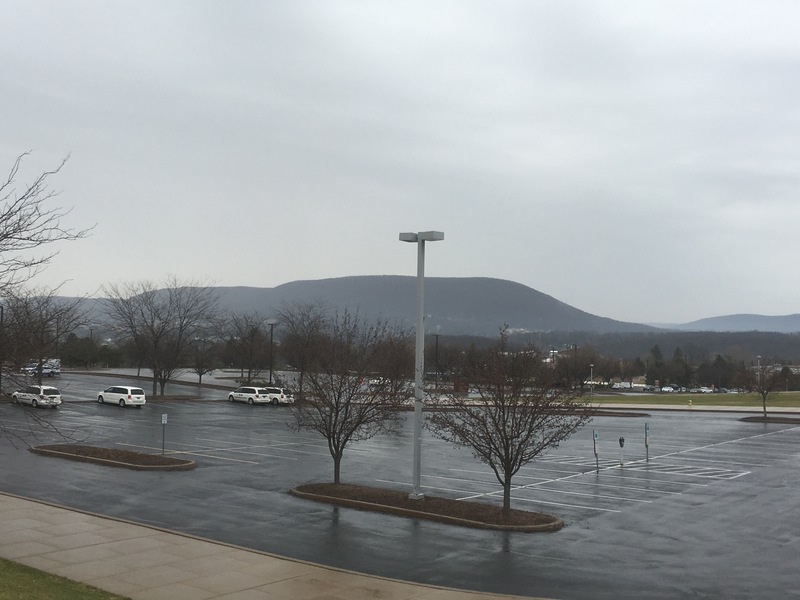 I decided at one point that I wanted to see Mount Nittany from the overlook on Penn State’s campus near Beaver Stadium and the Bryce Jordan Center, so that’s where I ran. The Mount Nittany Conservancy installed a great informational plaque there a number of years ago, and recently refreshed it with a newer version. It calls attention to the Mountain as our community’s landmark and symbol in such a key way, right where thousands congregate a few special Saturdays each autumn. Pay attention to the little things, and the big things take care of themselves. This parking lot light post is a little thing that distracts from the Mountain in a big way. It shouldn’t be there. Neither should those growing trees, which will eventually obscure the lower portion of the Mountain, especially when it’s not March and they’re in bloom. Move this stuff to the left, or install smaller posts and shrubs. Scenic spots should be scenic.